The boats wrote to say, they are hauled out and winterized. 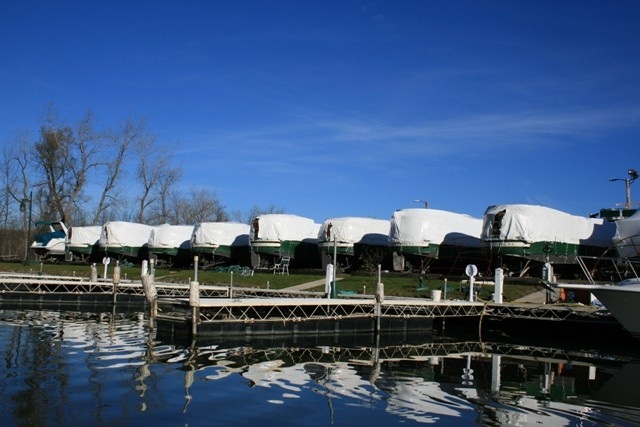 The boats pictured here make up the canal-boat fleet at Mid-Lakes Navigation, located in Macedon, New York (just east of Rochester). That's where Dragonfly got her start. 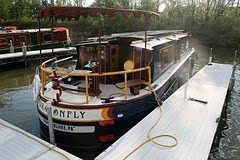 In her previous life Dragonfly was a hireboat on the Erie Canal. Families could rent her for a week or two of slowboating. She went east on the Canal. She went west on the Canal. For a really daring excursion, she might venture down the Cayuga-Seneca Canal and out on Cayuga Lake. But mostly, it was a quiet life. This winter, instead of resting quietly under a blanket of snow, she gets to go to Florida . . . after cresting the waves of the Great Lakes, navigating the mighty Mississippi, and crossing the Gulf Coast. We like to think she's enjoying her little adventure.